These photos are from the late February bloom. The multitude of delicate, white flowers, known as “Kona snow,” emit a lovely, fairly subtle, sweet-smelling fragrance similar to jasmine; it’s not an overwhelming olfactory experience. 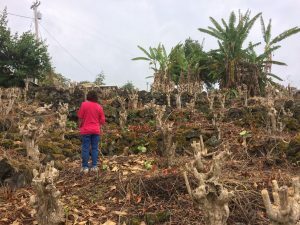 Our farm is at the southern end of the Mamalahoa Kona Heritage Corridor. 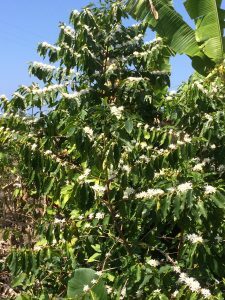 My husband and I like to cycle along the curvy Old Mamalahoa Hwy, and it is a heavenly experience to ride here when the coffee trees are blossoming/peaking. Farm after farm. No shell of a car separating you from the sights and smells of Kona nature. The coffee land has been cleaned up! We are having to make up for some years when the land didn’t receive the tender loving care it required. The photo on the left is from October 2016. You can just see a little of a red roof to the right of the utility pole. This land is fertile! You have to be diligent about keeping the undesirable growth away. 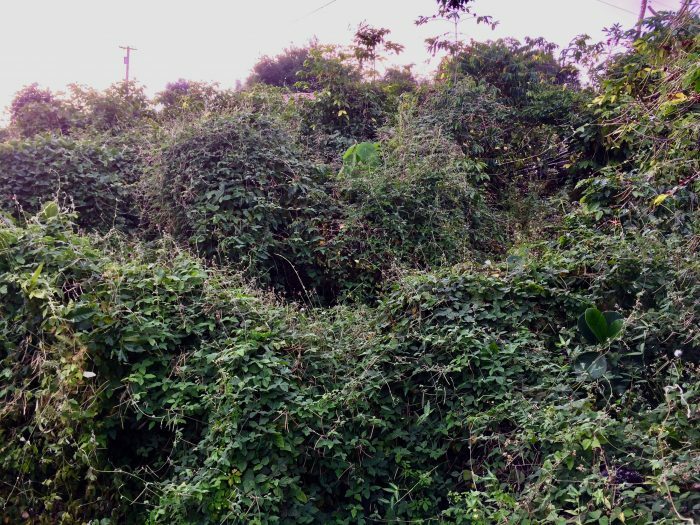 There were coffee trees under all that ivy! And they survived, as the current photo on the right shows. 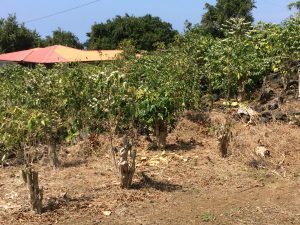 Also, for the first time, this coffee land is being pruned in the Beaumont-Fukunaga style, a vertical pruning system with a three-year rotation. 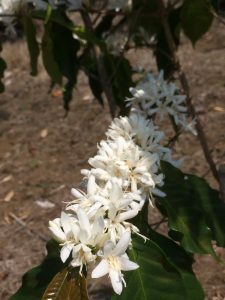 One of the main reasons for using this pruning style is to control the coffee berry borer (CBB) beetle, a pest that wasn’t around in my grandparents’ time. 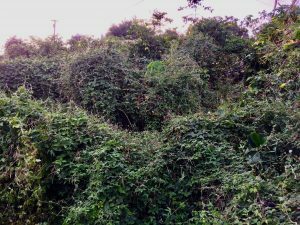 Our land is being pruned in blocks, versus rows, because of its hilly terrain. For now, we have to mimic the trees with two- and three-year old verticals. Below is one of the blocks which has been stumped, which will have the one-year old verticals. Note the thick trunks, showing the age of these trees (80+ years old). They’ve never experienced this tough love pruning. Check back in a year to see how these trees can bounce back. We hope! We’ve seen other farmers’ trees about the same age survive and thrive. Also in the photo … that’s the back of Bea’s knees.